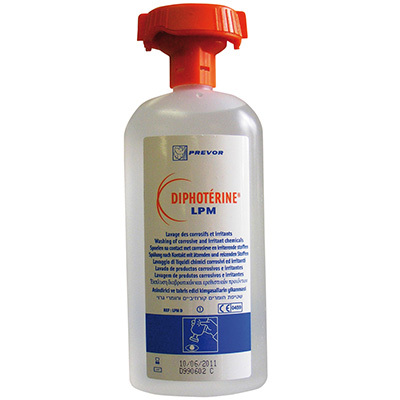 Diphoterine® solution is an emergency rinsing solution for splashes of chemical products. Its rapid use in case of contact between the skin or eye and a chemical product is intended to quickly eliminate the residual chemical product on the skin or in the eye. 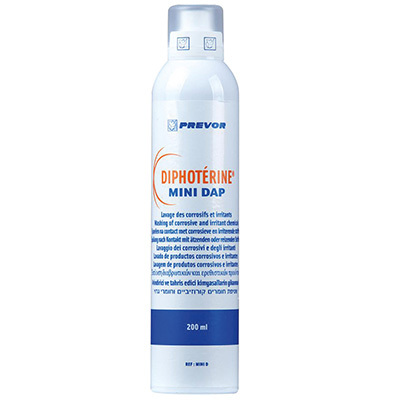 This makes it possible to limit the extent of the burns and lesions caused. 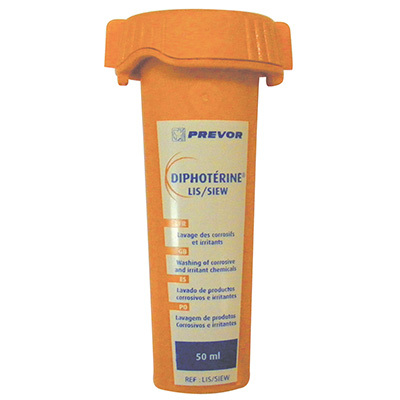 Diphoterine® facilitates secondary treatment of the burn injuries by restricting the extent and severity of the lesions. The knowledge acquired during our research work on the mechanisms of the lesions caused by chemical products on soft tissues have allowed us to develop this technological solution for emergency rinsing of chemical splashes. Prevention and implementation of first-aid solutions are essential in all situations involving a risk of human skin or eye contact with a chemical product. 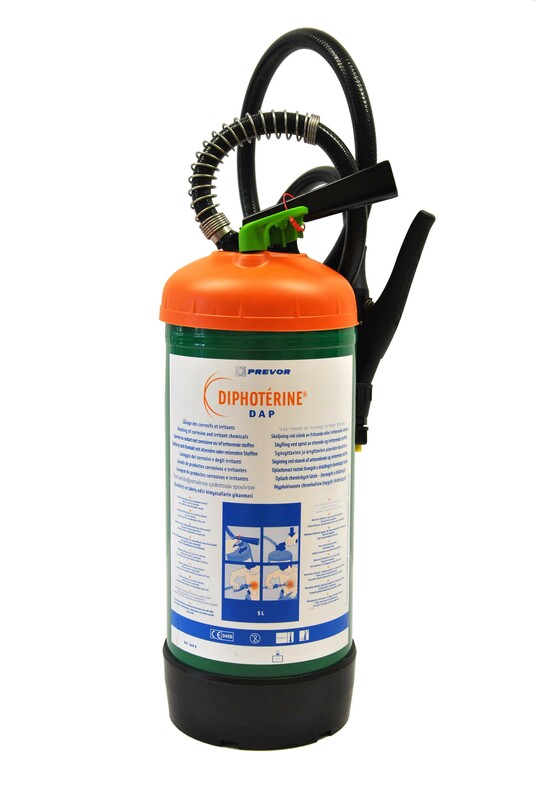 In case of an incident, Diphotérine® solution allows performance of emergency decontamination. Historically, emergency rinsing with water represented an initial element of crucial progress in decontaminating chemical splashes. 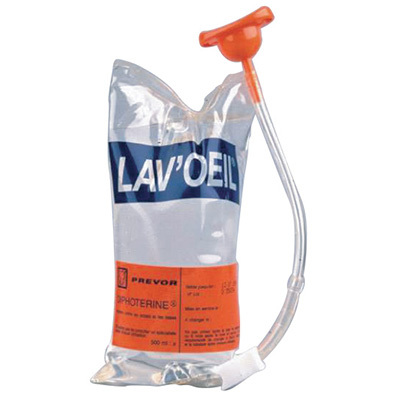 Use of water as a first-aid solution has its limits however. 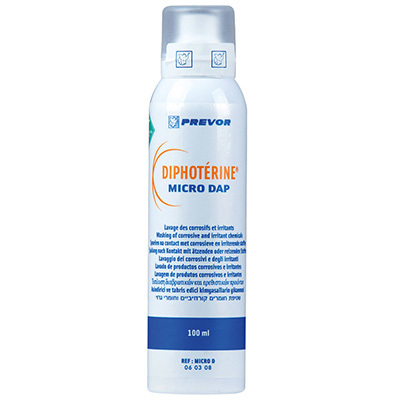 Owing to its physical and chemical properties, Diphoterine® solution allows rinsing to be performed more effectively than with water in case of splashing of chemical product.